Programme that offers a female perspective. A tribute to Caroline Aherne, Georgia O'Keeffe's art re-assessed and a look at the female contenders for the Conservative leadership. 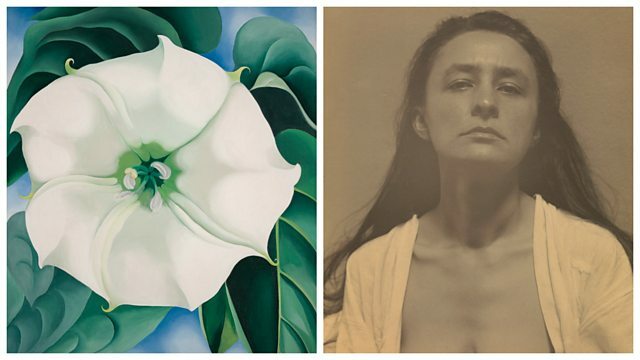 Do Georgia O'Keeffe's flower paintings actually depict vaginas? It was her husband who first said so and O'Keeffe always denied it. In a major new exhibition the full range of the work of this pioneering modernist artist is on show and the curator Tanya Burson tells Jane Garvey why it's time conservative male readings of her art were challenged. On the day that MPs begin voting in the Conservative leadership race, we hear from Armed Forces Minister Penny Mordaunt on why she's supporting Andrea Leadsom, and from Caroline Spelman MP, who's backing Theresa May for the top job. Comedy writers and performers Diane Morgan AKA Philomena Cunk and Morwenna Banks pay tribute to Caroline Aherne. Emma Straub's last novel, The Vacationers spent ten weeks on the New York Times bestseller list. She now has a new novel, Modern Lovers. Set in Brooklyn over one summer, it's about two couples, neighbours and old friends, now nearing 50, whose teenaged children start sleeping together. Jane talks to Emma about the shock of middle age, the effect on the couples when their children become sexually active, passions that never go away and whether people ever grow up. How did you get your dream job at the Tate Modern? Conservative Party Leadership - who is backing who?